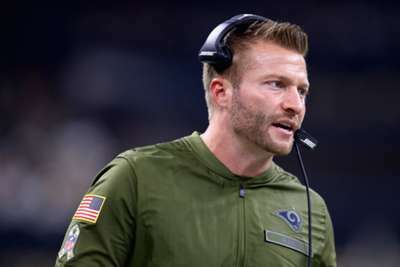 Sean McVay accepted responsibility as the Los Angeles Rams' winning start to the NFL season came to an end at the New Orleans Saints. The Rams threatened a fightback following a one-sided first half and scored 18 straight after half-time to tie the game, but Brees reconnected with Alvin Kamara and Michael Thomas to hand Los Angeles their first defeat. While New Orleans move to 7-1 after seven straight wins, the Rams are pegged back to 8-1 and coach McVay believes his calls contributed to the defeat. "I thought our team did a great job fighting back in the second half," McVay told a news conference. "We had some things that didn't go our way in the first half - they jumped out to a 21-point lead - we were able to get a field goal at the end of the first half and then tie it up at 35 apiece. "There were some play selections by me where I didn't put us in good spots to get back in that game. "The defense tightened up, they made the critical plays at the end and did an excellent job. I can't wait to go back and look at this film and figure out what we can do to be better." Los Angeles QB Jared Goff threw for 391 yards and three touchdowns but also had a costly interception. He is confident the Rams will bounce back. "It was a good, full four-quarter game and we showed our ability to fight back," Goff said. "Building on last week, we showed the ability to be down and be out and we made it a tight game at one point. "We were right there in it and just came up a few plays short. I think we're just going to learn from it and move on to Seattle [to play the Seahawks on Sunday]."